Best Sleeping Bag Liner (Top 5) & Why You Need it For Backpacking! Why Should I Use Sleeping Bags Liners For Travel? Backpacking through Southeast Asia usually means staying in a collection of accommodations that may be less than five-star! When it comes to cleanliness and comfort, one of the most important things to think about is your sleep. The reality is that you may find yourself faced with grimy sheets or, heaven forbid, the possibility of bed bugs! Better Safe than Sorry! If you’re on a tight budget and staying at cheap hostels, no matter what your luck is, you’ll be sure that you have a clean surface to sleep on when moving from hostel to hostel. Bugs: Protection against bacteria, insect bites, even the dreaded bed bugs. Get cosy: Create a comfortable sleeping experience for your skin. Your sleeping bag liner is a travel ‘sheet’ that will absorb any sweat and oil. Want to sleep in a hammock overnight? Just tuck up in your cosy sleeping bag liner! What Type of Sleeping Bag Liner Should I Choose? Finding the best sleeping bag liner isn’t a complicated process, all you need are a few simple pieces of basic knowledge, and you will be able to pick the right liner for you. The most important aspect of sleeping bag liners is the fabric they’re made from, as this will determine your level of comfort. When it comes to spending time in Southeast Asia, your best bet is to choose a silk sleeping bag liner. Silk liners for sleeping bags are the ideal choice for your backpacking needs for a number of reasons. Silk is a very lightweight fabric and liners made with this fabric can be folded into a compact package easy to carry. While they can provide an extra layer of insulation in cold weather, silk liners for sleeping bags remain breathable and absorbent in warmer conditions. If you’re not a fan of silk, cotton is another good liner sleeping bag choice. Some of the best sleeping bag liners are made from cotton, as they are both affordable and durable. Keep in mind that while cotton liners are absorbent, they are not as lightweight or compact as their silk counterparts. The Friendly Swede provides you with an option like a silk liner for sleeping bag but made from Polyester. This liner will feel silky against your skin and keep you cool and clean in any sleep setting. The Friendly Swede liner comes in a large size so that you can stretch out on the bed you’re sleeping on, and even has a pillow pocket. The side zipper makes getting in and out of this liner super simple and fast. When you’re ready to pack up your liner and transition to your next location, you will be pleased to find that it’s lightweight and becomes very compact to save space in your backpack. Whether you have specific skin sensitivities or simply want to stay as clean as possible and protect against critters, this liner will help you sleep soundly. If you prefer the feeling of cotton over silk, the Cocoon TravelSheet may be just what you’re looking for. This liner is designed with a pillow pocket, Velcro side closure, and double-stitching for optimal durability and convenience. Though this liner is made from cotton, it is very thin, which makes for comfortable sleeping even in tropical climates. The liner is very easy to clean, even if you only have time to rinse it and hang it to dry, so you can freshen it up each day. 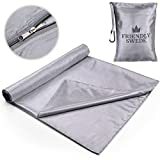 You will be able to fold the liner into a compact package, put it in its carry bag and add it to your backpack, without making much of a dent in your space. The best feature of this liner is that it is super soft and will make you feel like you’re in your favourite bed! The Marycrafts sleeping bag silk liner is an ideal option if you prefer pure materials. The liner is available in a few different colours to suit your preferences and is very easy to keep clean and dry, as you make your way from place to place. This liner will cover your whole sleeping bag or space, including your pillow, but folds into a compact size to fit into its carry bag. The Mulberry Silk which this liner is made from is very soft and breathable, yet durable, making for a comfortable way to sleep for many trips to come. This liner will keep you cool and safe from bed bugs at hostels and also warm as you transition to new places on air-conditioned buses! 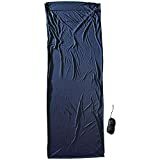 The OUTRY sleeping bag liner is a 100% cotton option that will keep you sleeping comfortably throughout many trips to different places in different climates. If you plan to choose the OUTRY liner or another cotton liner for your time in Southeast Asia, you will likely find yourself sleeping with the liner alone in the warm conditions. This liner is very flexible in that it can be used to cover a whole sleeping bag, including the pillow. The OUTRY liner folds into a fairly compact bag to add to your backpack and is very easy to clean. This liner is available in both single and double sizes, depending on your travel needs, and comes in a variety of colors and patterns to fit your personality and backpacking mood! If you’re equally concerned with staying cool while you sleep and avoiding any interaction with bed bugs, then you may want to invest in the liner by Sea to Summit. This liner is made from a stretchy fabric which will keep you comfortable and wick moisture away as you sleep. The CoolMax liner is designed specifically to adapt to the current temperature and level of humidity for a good night’s sleep in warm conditions. This liner folds down to a compact size and comes with a carry bag for easy transport. There is no zipper on this liner, so you will need to crawl in and out. You will find it very easy to keep this liner clean from day to day. You may want to keep extra bug repellant with you, as you may notice the built-in shield start to falter after a collection of washes. 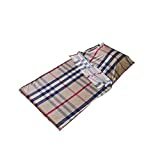 Brave Era offers you a sleeping bag liner silk, which is made from 100% quality material. The liner is durable and designed with a pillow pocket, but folds into a surprisingly compact size, weighing no more than your iPhone, and fits into a small carry bag. The Brave Era silk liner will allow you a clean sleep no matter where you are, and help you avoid bed bugs and other insects. The whole point of using a liner is to sleep as cleanly as possible, and this liner makes it possible, as it is super easy to wash and air dries quickly. All you need to do is take out your liner, lie down, and you’ll be cool and comfortable, and ready for a good night’s sleep! The Scottish Silkworm liner is a poly-microfiber model, which is more lightweight than cotton, more breathable than polyester, and stronger than silk. The liner works well to cover your full sleeping bag and pillow or to cover a hostel bed with questionable sheets. You’re probably imagining yourself using this liner to sleep at night but expand your perspective and consider that this liner can keep you cool at night, but also a bit warmer on long air-conditioned bus rides in Southeast Asia. This is an affordable, easy to wash liner that is best suited for people of smaller stature! Choose the best sleeping bag liner for you! Packing a sleeping bag liner for your adventures in Southeast Asia is definitely a necessity. It’s a small investment that will give you peace of mind and comfort everywhere you sleep. Stay cool, avoid dirty sheets, and keep the bed bugs away with your liner! Some of the links on this page are affiliate links. South East Asia Backpacker Magazine is a participant in the Amazon Services LLC Associates Program, an affiliate advertising program designed to provide a means for sites to earn advertising fees by advertising and linking to Amazon.com.